Facing Climate Change in a post-truth world - agrandstandfortheenvironm's JimdoPage! Our AGM was on Friday 18 May 2018. Watch this space for our next event on Sunday 22 July 2018. 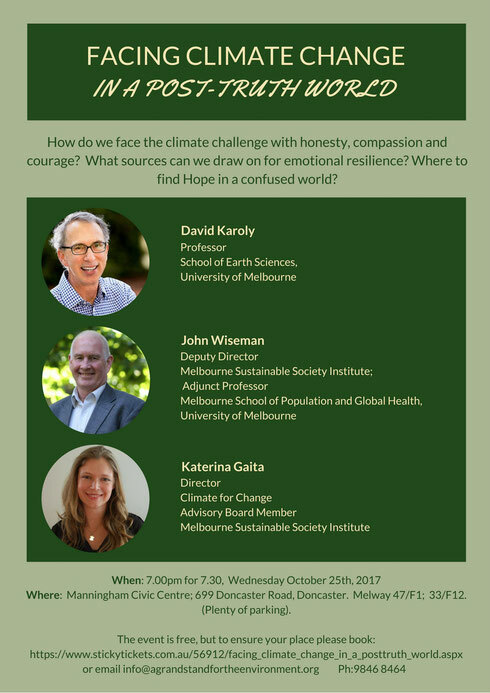 Email info@agrandstandfortheenvironment.org or phone 9455 2581 for venue and details. Facing Climate Change in a post-truth world. Clearly climate change is happening across the world. How can we make a meaningful national response amidst so many false claims, self-interested lobbyists and plainly "fake news" editorial? Special Forum on Wednesday October 25, 2017.